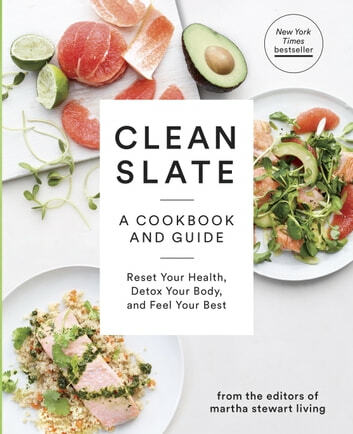 More than just a cookbook, New York Times bestselling Clean Slate is the complete go-to guide for boosting your energy and feeling your best. It’s time to hit the reset button. This book emphasizes eating clean, whole, unprocessed foods as part of a primarily plant-based diet, with delicious and healthy recipes that make it easy to do just that. Refreshing juices and smoothies, savory snacks, protein-packed main dishes, and even delectable desserts will keep you satisfied all day long; among them are plenty of vegan, vegetarian, gluten-free, and allergen-free options, each identified by helpful icons. Clean Slate also provides you with the nutritionally sound information you need to shop for and prepare food that nourishes body and mind. You’ll find guidelines for restocking your pantry with whole grains, beans and legumes, lean proteins, and healthy fats; glossaries of the best sources of detoxifiers, antioxidants, and other health-boosting nutrients; and menus for a simple 3-day cleanse and a 21-day whole-body detox, with easy-to-follow tips and strategies for staying on track. Easy to follow. Very simple recipe but missing some creativity. Eg. Boiled eggs with mustard. Do you really need a recipe for that?